Copyright © Orlando Olivieri 2017 - This image is copyrighted. Unauthorized reproduction prohibited. 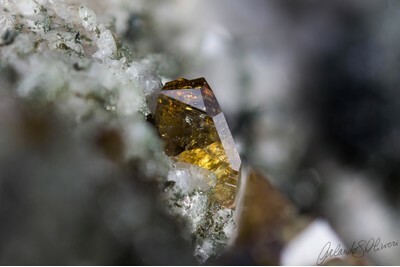 Really beautiful small crystal, measuring 3 mm, whose colour looks even better, turning from bright yellow at the base to dark orange at the top; the crystal is a twin and it is perfect all around. A little exemple of perfection.